A residential gate is a great investment to make for your North Hollywood, California home. Not only is it a great way to increase the security of your home, it can also give the value of your home a boost. 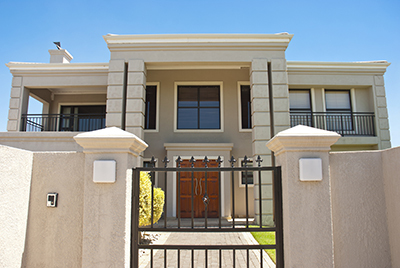 Depending on your homeowner’s insurance company, you may even qualify for a discount off the cost of your insurance simply by installing a security gate. However, there are so many different types of gates available on the market that it can be difficult to determine exactly which North Hollywood residential gate you should buy for your home. Residential gates can be made in a number of different materials including steel and wrought iron. Gates made of metal are often more secure than gates made of wood. However, wood gates offer more privacy. If your home is set back a ways from the end of your driveway so that privacy isn’t much of an issue then it is best to get a North Hollywood residential gate made from a strong metal. These types of gates tend to last longer and need less maintenance than gates made from wood. Additionally, they add an elegant touch to your home’s exterior décor. 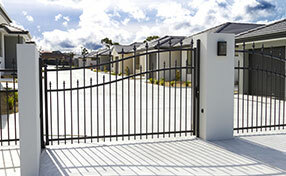 There are two types of residential gate installation you can get: swing gates and sliding gates. Swing gates are just as they sound. They swing inward or outward on hinges. They can be single panel gates that open on the left or right or double panel gates that open in the center. Sliding gates slide to the side on a track similar to a sliding glass door. They, too, can be either a single panel or double panel installation. Both types of gates require enough room to open. However, those with short driveways but wide yards may be better served with a sliding gate while those with long driveways and slim yards may do well with a swing gate. 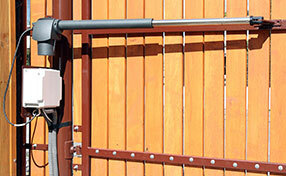 A North Hollywood residential gate installation can be wired or wireless. Unless you are building a home from the ground up it is probably cheaper to get a wireless solution. A wired residential gate will require the installers to dig up your yard to lay down the cabling. On the other hand, a wireless residential gate sends a signal along the radio waves so, other than putting the gate into the ground, very little construction is required. 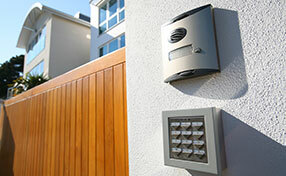 In addition to standard residential gate openers, you can program your cell phone to act as a wireless gate opener. Assess your lifestyle and decide which options are best for you.